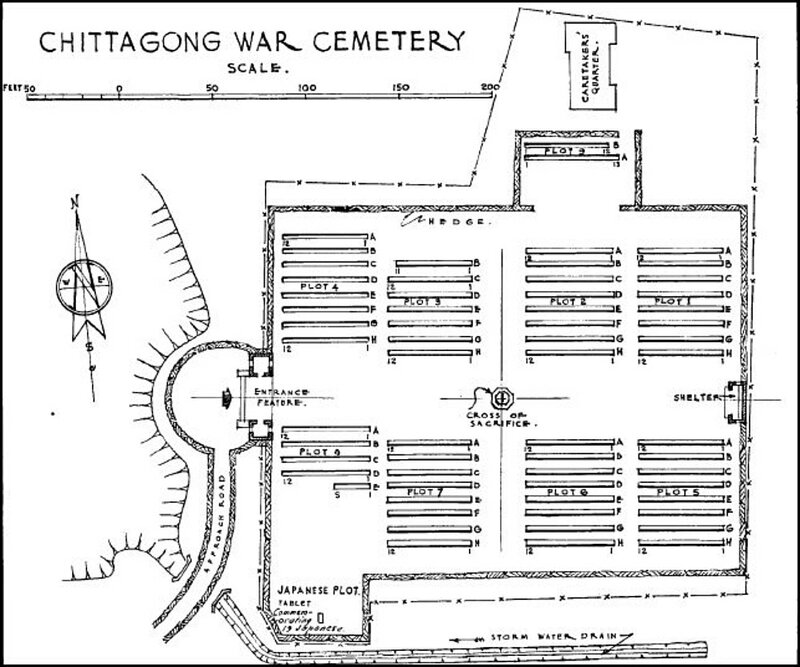 Chittagong War Cemetery is in Dampara locality, No.19 Badsha Mia Chowdhury Road, 22 kilometres north of the airport and 8 kilometres from the port on a site which was formerly paddy fields, but which has now been developed. It is near the arts college and close by Finlay's Guest Houses near Chatteshanry Road; a well known road leading to the Hindu Kali Bari Temple. There is no C.W.G.C. road direction sign. The Burial area is situated at the bottom of a slope directly behind Finlay's Guest Houses and is surrounded by a large area planted with a mixture of jungle trees,fruit trees and flowering trees. It is not easily seen from the road. A narrow tarmacked lane leads from the entrance gate to the burial area which is entered through a metal gate flanked by two small brick chapels. The cemetery gates are open from 07.00 to 12 noon and 14.00 to 17.00. Within the cemetery will also be found the Chittagong Memorial which, together with the Bombay 1939-1945 War Memorial, to be found in the Indian Seamen's Hostel Bombay, commemorates over 400 sailors of the former Indian Navy and nearly 6,000 sailors of the former Indian Merchant Navy who were lost at sea during the war years. Each memorial takes the form of a finely bound volume containing the names of the dead. 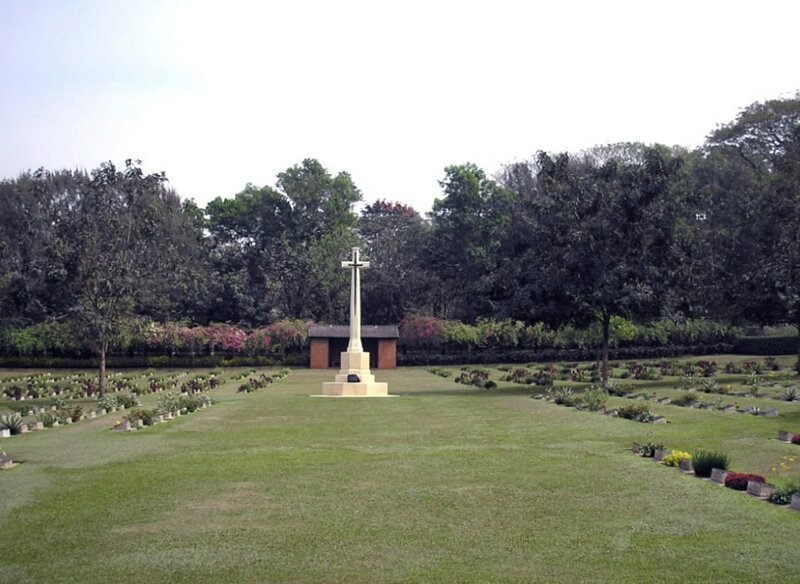 Chittagong War Cemetery is open every day between 08:00-12:00 and 14:00-17:00. Wheelchair access possible via main entrance. 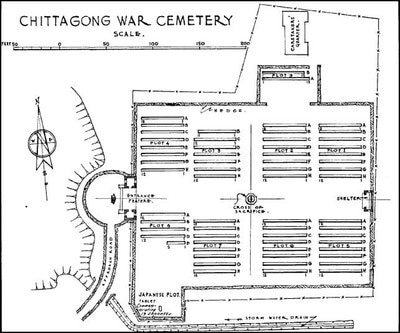 The cemetery was created by the army, and there were originally about 400 burials. 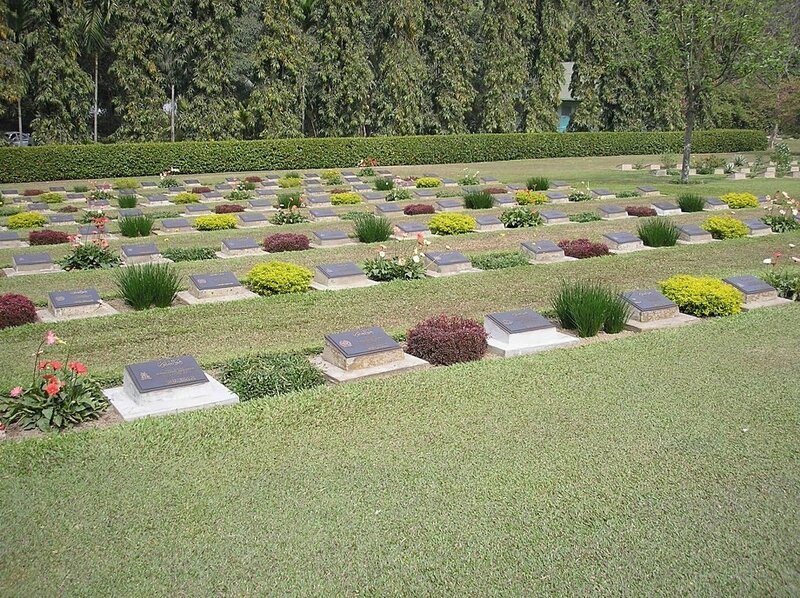 Graves have since been transferred to this cemetery from the Lushai Hills (Assam) and other isolated sites, and from Chittagong Civil Cemetery; Chandragona Baptist Mission Cemetery; Chiringa Military Cemetery; Cox's Bazar New Military and Civil (Muhammadan) Cemeteries; Chittagong (Panchalaish) Burial Ground; Dacca Military Cemetery; Demagiri Cemetery; Dhuapolong Muslim Burial Ground; Dhuapolong Christian Military Cemetery; Dohazari Military and R.A.F. 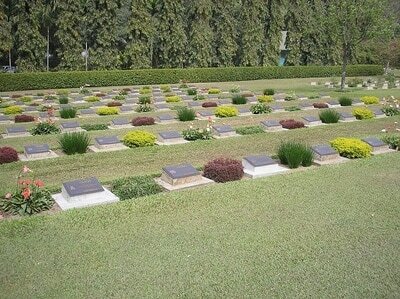 Cemeteries; Jessore Protestant Cemetery; Khulna Cemetery; Khurushkul Island Christian and Muhammadan Cemeteries; Lungleh Cemetery (Assam); Nawapara Cemetery (Assam); Patiya Military Cemetery, Rangamati Cemetery; Tezgaon Roman Catholic Cemetery; Tumbru Ghat Military Cemetery and Tumbru M.D.S. Hospital Cemetery. There are now 731 Commonwealth burials of the 1939-45 war here, 17 of which are unidentified. There are a further 20 Foreign National burials, 1 being a seaman of the Dutch Navy and 19 Japanese soldiers, 1 of which is unidentified. There are also 4 non war U.K. military burials.